Plutarch, bust from the museum of Delphi. LacusCurtius’ Bill Thayer is now especially occupied with making available the biographies of a long series of nineteenth-century American officers (here), but in the meantime also continues to put online some ancient stuff. Today’s contribution came, to me, as a pleasant surprise: Plutarch’s essay How We may Become Aware of Our Progress in Virtue, one of my favorite texts from Antiquity. 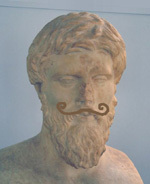 It’s polemical: the Stoics had argued that only wise people can be virtuous, and Plutarch shows that this is absurd. Admittedly, Plutarch’s suggestions on how we realize that we’re becoming more virtuous/wise, is rather commonplace. Yet, it is a good question – perhaps one of the best questions we may expect from philosophers. It is said that the viper (aspis) was brought with those figs and leaves and lay hidden beneath them, for thus Cleopatra had given orders, that the reptile might fasten itself upon her body without her being aware of it. But when she took away some of the figs and saw it, she said: “There it is, you see,” and baring her arm she held it out for the bite. However, this cannot be true. A viper’s bite is not fatal. Only a few scholars have realized the problem, and they have argued that in fact a cobra must be meant. However, the Greeks and Romans were perfectly capable of distinguishing several kinds of snakes. The poet Lucian even offers a catalog of reptiles (with their poisonous effects) in his Pharsalia, book nine. I do not know what really happened, but I have an idea: Octavian sent a soldier to kill the queen, because he could not afford to capture her. Just imagine that he returned to Rome with a woman tied to his triumphal chariot. The Romans would joke that he had not won a major war, but had merely defeated a woman. There is, of course, no evidence for this theory, but at least it is possible. That’s more than we can say about a fatal viper’s bite. LacusCurtius‘ Bill Thayer continues to add texts documenting Greek intellectual life. To start with, there’s Plutarch‘s Consolation to Apollonius, “into which quotations from earlier authors have been emptied from the sack rather than scattered by hand”, as the author of the introduction to the Loeb edition remarks. His explanation for this odd phenomenon is that this text is the rough draft of a letter. If this is true, we can see how Plutarch really thought – jumping from one quote to another. This man’s thoughts were shaped by classical texts, literally. The second text is Plutarch’s Dinner of the Seven Sages, which is essentially a fun text comparable to an imaginary meeting of Shakespeare, Cervantes, and Montaigne. What would the Seven Sages have said, had they been able to meet each other? The joke is, of course, that real quotes of the seven sages had to be used. The third text is Theophrastus’ Weather Signs (Περὶ σημείων): a mixed collection of popular wisdom. I found it more interesting than I had expected. One would have expected something more profound from a pupil of Aristotle. The regular readers will by now have realized that I am currently focusing on Jordan in Antiquity; I will visit that country in November, in šāʾ Allāh. Before I will put online a page on the Nabataeans, I’ve first made available several inscriptions. The photo to the right shows a funeral inscription now in the Louvre; it is from the tomb of a grandfather and a grandson, and contains an interesting Greek loanword. Three other inscriptions can be found here; one of them dates -amusingly- from the exactly the beginning of our era, the month of Tebeth of the ninth year of Aretas IV, i.e., the two last weeks of 1 BCE or the two first weeks of January 1 CE. The Deir ‘Alla Inscription is about eight centuries older. It describes the revelations of the prophet Balaam, son of Beor, who is also known from the Biblical book of Numbers. In the first part, he describes how a group of evil deities wants to destroy the world, and how Balaam is able to avert this danger; a second part describes Sheol, the Underworld. Meanwhile, Bill has made available uncle Plutarch‘s unfinished declamation On Affection for Offspring. Another “request” item; this time, a real request, from my friend Susan, whose site Elfinspell is a Wunderkammer of mediaevalia and classical Antiquity. So, tracking down a sort-of citation in chapter 5 of Sir John Lubbock’s The Pleasures of Life, another bit of Plutarch: On Brotherly Love; just in English. A French translation is available at Philippe Remacle’s site; neither of us yet have the Greek. There’s a lot of Plutarch left! Right now, only 40% of the Moralia are onsite (40.2%, to be precise). From my fingers to God’s ear; I hope He has something better to do — this one is none too good, although here and there it makes up for it in downright weirdness: ps‑Plutarch • Is Water or Fire More Useful? (no Greek online anywhere that I know of, and I didn’t add any, either).